As of today, all of our java 10 builds no longer work (they did yesterday). I noticed in the JDK tools provided config in the jenkins admin pane that jdk 10 is no longer an option. Latest is now 9.0.4, which I presume is the root cause. Is there anything that can be done at the plugin provider level, or is this something Oracle related or licensing? The problem is that the layout of Oracle's website has changed, which broke the crawler on the Jenkins infra side. See JENKINS-54305 for additional details, in short, we want to deprecate the current jdk tool entirely, and to perhaps replace it by using AdoptOpenJDK. For now, the only workarounds I know of are to preinstall the JDK on your agents so you don't need to use Jenkins to install the JDK, or to use the "Run Shell Command" installer method instead of "Download from java.sun.com" and run something like "apt-get install openjdk11" or similar. I am a little surprised that you only started seeing this today, and not earlier, but maybe it coincided with an update on your side? 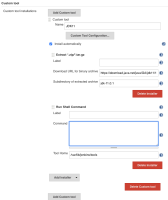 Devin Nusbaum added a comment - 2019-01-09 14:28 The problem is that the layout of Oracle's website has changed, which broke the crawler on the Jenkins infra side. See JENKINS-54305 for additional details, in short, we want to deprecate the current jdk tool entirely, and to perhaps replace it by using AdoptOpenJDK. For now, the only workarounds I know of are to preinstall the JDK on your agents so you don't need to use Jenkins to install the JDK, or to use the "Run Shell Command" installer method instead of "Download from java.sun.com" and run something like "apt-get install openjdk11" or similar. I am a little surprised that you only started seeing this today, and not earlier, but maybe it coincided with an update on your side? Perhaps, it could be that one of our slaves got re-provisioned as we use the EC2 plugin to start and stop slaves - perhaps one today got re-provisioned.